Pneumatic linear actuators are the most common type of actuator used in industrial applications to assist with frequent flow changes. Pneumatic linear actuators use air or gas to push the spindle up or down to the desired location, depending on the closed position needed. Springs are used to facilitate the upward/downward movement of the spindle as the air or gas pressure is adjusted. 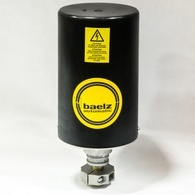 Baelz pneumatic actuators can be supplied with many different spring counts to meet all the pressure requirements that the process demands. 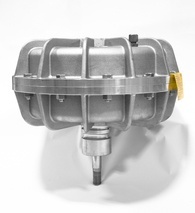 These type of valve actuators are a good fit for processes that require an emphasis on speed (quickly moving/controlling the valve), while still being able to achieve a level of accuracy. Electric linear valve actuators are renowned for extreme precision, with a typical model offering +/- 0.000315 in accuracy and less than 0.0000394 in repeatability. In contrast to their pneumatic counterparts, electric linear valve actuators use electricity to produce movement. The electric actuator pulls and pushes the spindle up and down on the control valve. The torque of the motor turns the gears that rotate the actuators spindle clockwise or counterclockwise to precisely the position needed. Since electric actuators provide comprehensive diagnostic information, they are easily programmed to suit the user’s needs. Baelz motorized electric actuators can either be controlled using only 115V, 230V, or 24V power for open and close only operation. They can also be used with 0-10V or 4-20mA for exact modulation of the valve. These two types of actuators are used in a wide range of industries, including wood, automotive, food, chemical, energy, and more. Pneumatic actuators are best suited for processes that require a valve to open and close quickly. Electric actuators are a better option for more precise modulation and control of the valve position, an exact percentage of open vs. closed. These actuators should be used in processes where speed and time constraints are not a priority, however precise control within small frequency changes and position is needed. If you are seeking to fulfill a requirement for pneumatic or electric linear valve actuators, Baelz NA’s team of specialists will help find and select solutions that are tailored to meet your industrial plant process needs. Our other offerings include controllers and other components, heat exchangers, automation skid packages and engineered systems. If you’re interested in working with us, contact us today or request a quote online.